Still Life 2 remains true to the spirit of its first installment, but now allows you to play and manage two characters bound by the same fate. This time, the aim is to control two heroines, see the game from two complementary viewpoints and experience two different gameplays. Depending on whether you are playing Paloma Hernandez, the victim being hunted by the killer or Victoria McPherson, the FBI agent tracking him down, you can alternate between survival and investigation. 2014 ©Microids. All rights reserved. 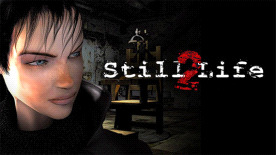 Still Life 2 is a trademark of Anuman and Microids. All rights reserved. All other trademarks and copyrights are the properties of their respective owners.